Wash and dry the chicken breasts. With the help of some kitchen scissors, cut each breast into four large nuggets and place in a large bowl. In a separate small container mix three tablespoons of mustard with three tablespoons of apricot spread. Pour the sauce over the chicken and stir until all the chicken pieces are evenly coated. Set aside. In another dish, combine the biscuit mix and panko together. Mix well. Prepare the baking dish by lining with baking parchment. Then take each piece of chicken and cover in flour batter before placing in the baking dish. Repeat until all the chicken has been prepared. Bake for 20-25 minutes, taking care to turn the chicken pieces over halfway through the baking time. Meanwhile, to prepare a sabroso dip, combine the last two tablespoons of apricot marmalade with one tablespoon mustard. When ready, remove the chicken from the oven and let sit for five minutes. 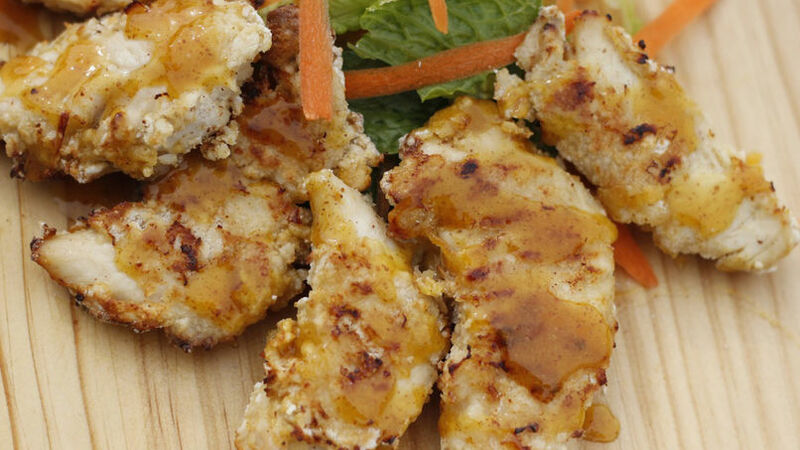 Serve immediately alongside the zesty apricot-mustard sauce. To save time when breading the chicken, add the biscuit mix and panko to a plastic bag along with the chicken. Shake the bag vigorously until all the pieces have been thoroughly coated. I’m a fan of fast homemade meals and I've frequently seen that in cooking 'less is more.' Simple ingredients allow us to better appreciate the flavor of a meal. Besides, I love to save time in cooking certain dishes in order to prepare something extra. One of the best things about this recipe is that it has five ingredients and is ready in less than a hour! It's so rica, the kids as well as the adults will enjoy this dish. It’s especially popular with the kids in my home–every time they see me preparing this meal they sit down at the dinner table right away. Make sure that when preparing this recipe, you get quality brown mustard, not the traditional yellow mustard. The brown variety has a light spice and a more profound flavor that pairs excellently with apricot fruit spread. ¡Buen provecho!